Time to get back, get back, get back to where you once belonged? 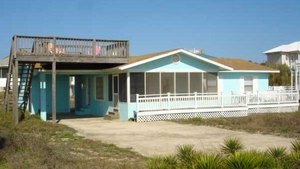 Buying a house at the beach used to be a life-long dream for many people - when you make the big time, when your ship comes in, when you come into your inheritance, when you retire. I'm finding that while the first part of this decade was all about building, buying, and maybe flipping the biggest, fanciest house you could get financed, we're now back to a generation of many who just want that sweet little house at the beach that used to be what going to the beach was all about. Bedrooms that weren't much bigger than the bed itself, or with 2 sets of bunkbeds crammed in. A screened in porch with a swing. Granite countertops? Who needs them? Formica cleans up just fine after a big spread of fresh seafood, french fries, and hushpuppies that you've cooked up for your family and friends. And, no one even used to blink an eye if there wasn't a TV, much less a phone. You were AT THE BEACH to be AT THE BEACH. We belonged to the beach for that week, totally. Maybe our knees are all going bad. Maybe we like the idea of the kids being able to run right out onto the beach from the house without having to worry about them tumbling down 47 stairs. Maybe it just makes for a quieter, more affordable vacation. For just us, now that the kids are gone. I don't really know, I just know that a little kernel of demand is there, and it's growing. 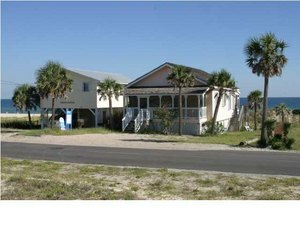 We still have these houses at St. George Island - not a lot of them, but a good number. Some of them are personal second homes, some are offered for rent, and some of them are for sale. 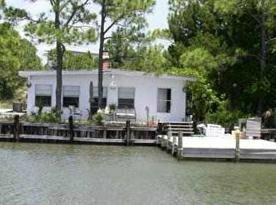 The ones at right are offered by sale by various brokers on St. George Island - call me for details or click the "Property Search" button above, MLS 106066, 201557, 234277. If you have a feel for this movement, let me know what appeals to you, what your memories are of those houses, how you think they stack up against the more recent development of bigger and bigger box houses. BTW, I'm not advocating that we try to change our building codes or anything - it's definitely safer to be up on pilings at the coast. And, those high-end finishes do pamper you in a way that nothing else does. But, for those homes that have stood the test of dozens of hurricanes as well hundreds of sandy feet, and are still just fine, doesn't it have a certain appeal?? ?